The top deck features are detailed in the company’s latest video previewing Royal Princess, viewable at princess.com/royalprincess. Sea Walk — Extending 28 feet beyond the starboard side of the ship, the SeaWalk will be one of the ship’s most striking features. At 60 feet long and hovering 128 feet above the ocean, this dramatic glass-bottomed walkway offers unparalleled views available on no other ship. Just as the captain on the bridge can look through glass panels in the floor of the bridge to get a look at the sea conditions below, passengers will now have that same sense of stepping out from the side of the ship for a breathtaking experience. Across the ship the SeaView Bar also extends over the waves for cocktails with unbeatable vistas. Fresh Water Pools — Directly adjacent to the SeaWalk on the ship’s expansive top deck area passengers will find a host of lounging options, beautiful palm trees, and two fresh water pools flanking an island area between them. During the day passengers can relax and rejuvenate poolside in a variety of seating options, including circular loungers, garden-style furniture, bar-height tables and stools, and chaise lounges. In the pool areas, entertainment options will include games and live music inspired by the ship’s ports of call. Water and Light Show — At night, the top deck of Royal Princess will transform with architectural lighting effects to set the mood. The island area between the two pools will become a stage showcasing an interactive sound and light show featuring dancing fountains. With a sophisticated lighting and sound system, and a computerized fountain featuring 85 water jets, passengers will marvel as streams of water shoot 33 feet into the night sky. Movies Under the Stars — Princess’ signature poolside theater will feature a 30 percent larger screen for true widescreen viewing, coupled with a high-tech visual and audio system for an unforgettable open-air movie-going experience. Passengers can enjoy movies, sporting events, and concerts while relaxing on a comfortable chaise lounge, complete with pillow, blanket, and free popcorn. For those who’d like to watch from the water, the ship’s large whirlpool spas above the pools offer great sightlines for enjoying Movies Under the Stars while soaking. Evening Entertainment — On select evenings, the island will be transformed into an outdoor dance floor and will play host to the popular Ultimate Deck Party. Perched two decks up on a special balcony, a DJ will get the crowd moving with an energetic music mix. 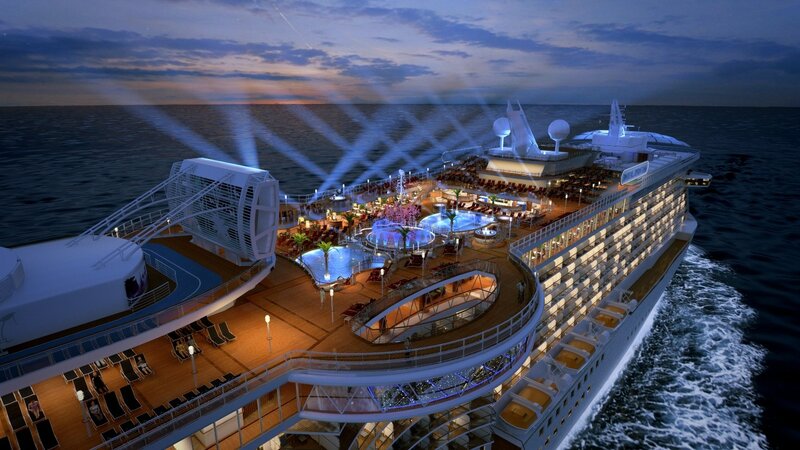 The 3,600-passenger Royal Princess is a new-generation ship currently under construction for Princess Cruises. Among the special features found on board will be a greatly expanded atrium, the social hub of the ship; a dramatic over-water SeaWalk, a top-deck glass-bottomed walkway extending more than 28 feet beyond the edge of the vessel; plush private poolside cabanas that appear to be floating on the water; the new Princess Live! television studio; a pastry shop; a special Chef’s Table Lumiere, a private dining experience that surrounds diners in a curtain of light; and balconies on all outside staterooms. The ship’s 2013 maiden season will include cruises on the line’s signature Grand Mediterranean itinerary throughout the summer, followed by Eastern Caribbean cruises beginning in the fall. More information and video previews of the ship are available at www.princess.com/royalprincess.